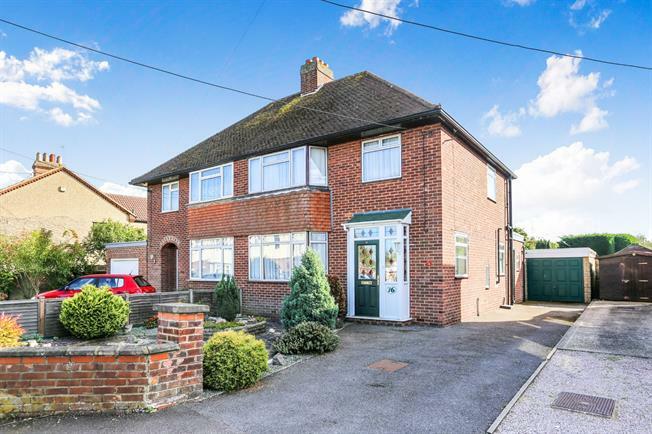 3 Bedroom Semi Detached House For Sale in Bedford for Asking Price £350,000. EXTENDED NO CHAIN Situated in a sought after location within a short distance of Flitwick mainline Railway Station and Town Centre is this extended three bedroom semi detached family home. With accommodation to comprise of entrance porch, entrance hall, kitchen/breakfast room, downstairs cloakroom, dining room, lounge in excess of 21ft and a conservatory. First floor comprises of two double bedrooms both with fitted wardrobes, third bedroom and a four piece family bathroom. Further benefits include a Southerly facing rear garden in excess of 80ft, off road parking and a garage. Extended with sliding doors leading to conservatory. Fitted to comprise of wall and base units with roll top work surfaces over, space for oven, window to side aspect. UPVC sliding door leading onto garden, window to side and rear aspect. Double bedroom; fitted wardrobes and window to front aspect. Double bedroom; fitted wardrobes and window to rear aspect. Single bedroom; window to front aspect. Low level WC, panelled bath with mixer tap, corner shower, pedestal sink with mixer tap, window to rear aspect. Approximately 80ft long, mainly laid to lawn with patio area.